Creating a convenient access point to the space underneath the floors of your business establishment can save you a lot of time and stress. Whether you need to repair damaged electrical wiring or upgrade electronic equipment located below the flooring, it is much easier to accomplish the task with a floor hatch. Our company can provide you with a floor hatch that is custom-fitted to the layout of your business. We can also recommend roof hatches at your request. The area underneath the flooring of an office building is often an important space used for housing electrical equipment and wiring. It can also be used for additional storage of other office equipment and material. If you want to access this space quickly and easily, you need a floor access hatch. Our company can supply with floor hatches of every kind. The floor hatches we offer are generally made of aluminum. You can have them both indoors and outdoors, and there are multiple designs available in order to accommodate your specific needs. 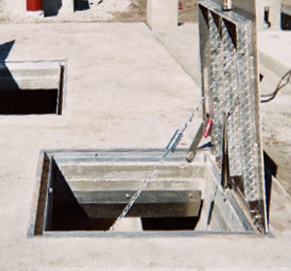 Some floor hatches are designed to be bolted down while others are cast into concrete surfaces. There are also a number of other special properties you can request for your floor access hatch. Tell us what you want out of your floor hatches and we will recommend the right models for you. There are numerous floor hatch models to choose from. Whether you want a hatch designed to be bolted down or one that you can cast in concrete, we have the model you seek at a price you can afford. Contact us today to learn more about the multitude of floor access hatches we have in stock. We are proud to serve customers throughout Maryland including Annapolis, Baltimore, Columbia, Glen Burnie,and Pasadena.